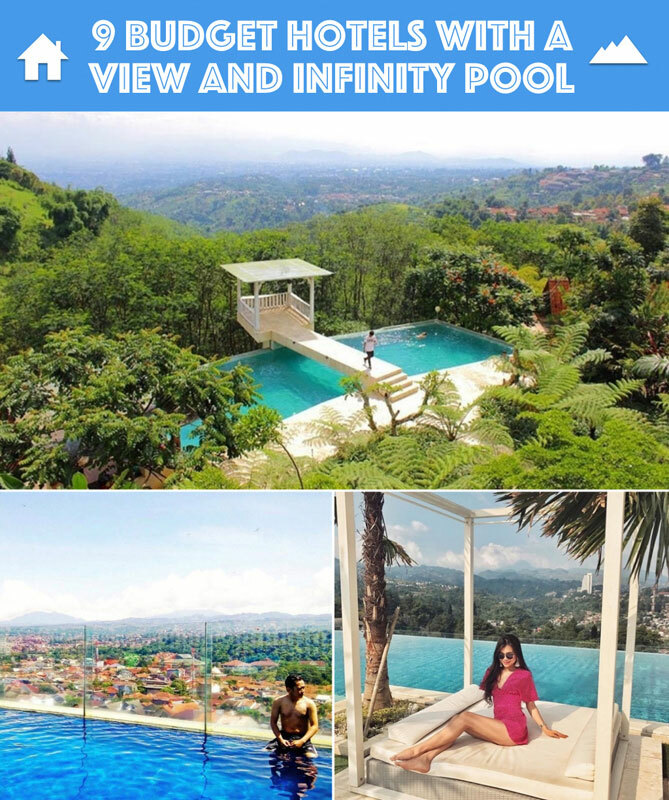 Indonesia > Bandung > Our one-stop guide to Bandung for first-timers: Best things to do, where to eat, shop and places to stay! When I first travelled to Bandung with my husband (then fiancé) for our pre-wedding photoshoot, we were delighted to discover the city’s natural attractions along with the several cute cafes (hands-down some of the best in Indonesia! ), iconic streets, cheap factory outlets and a creative local industry that made it more captivating! As our family grew bigger, I returned for more – either for shopping sprees with my sisters or simply to enjoy mid/end-of-year holidays with the kids. Besides being a great shopping destination, Bandung, especially Lembang, works fabulously for kids of all ages! And just like all great destinations, Bandung’s food scene also offers an exciting culinary ride from mouthwatering modern cuisine to one-of-a-kind local street food. Furthermore, you can find a vast variety of unique accommodations here – and all these in cooler temperatures! 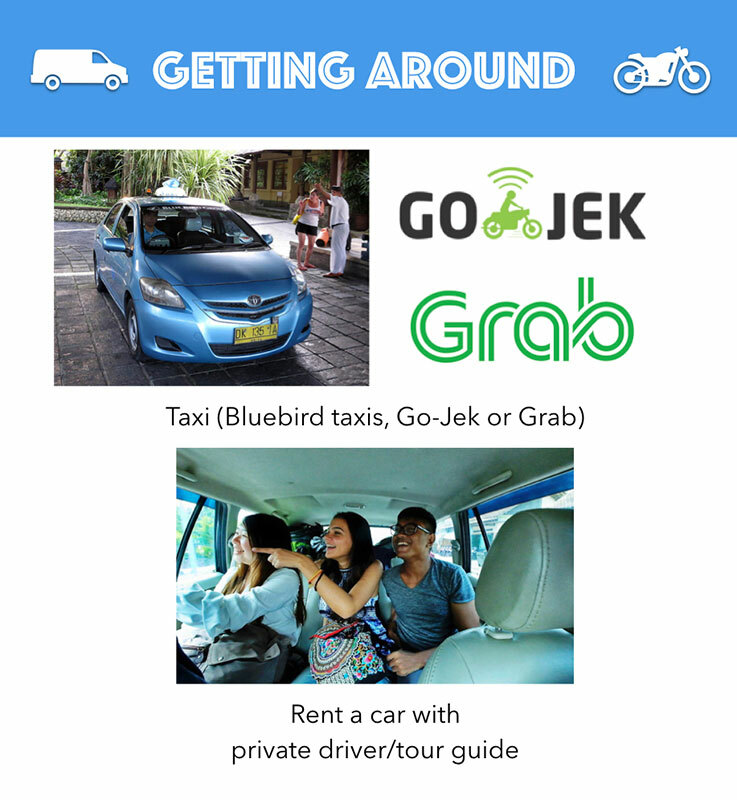 So check out this first timer’s guide to the Paris of Java where you can find all you need! Take the Cikampek-Purwakarta-Padalarang highway (about 120 km or 3-4 hour drive with no traffic). Toll fare is around Rp. 54,500. Home to 2.5 million people, Bandung is the 3rd biggest city in Indonesia with a lively yet relaxing vibe. On arrival, make sure you get to familiarise yourself with the city’s four main coordinates. The airport is located at the West point where most industrial and residential areas are. To the North, there are universities and several popular malls such as Paris Van Java and Bandung Trade Centre, along with its rows of factory outlets. Further North from this downtown area you will reach the region of Lembang (the lush and chilly suburb). 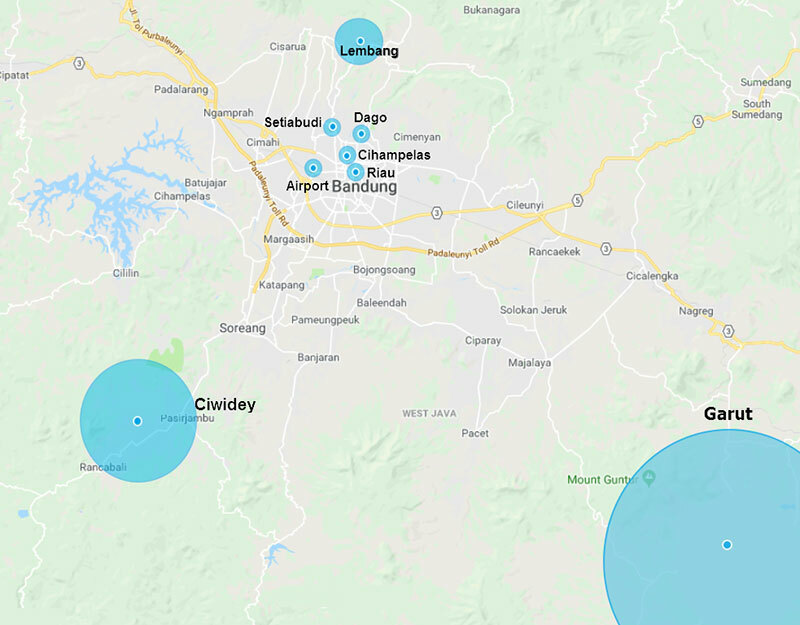 To the East and South of Bandung, you’ll find lesser well-known areas and also the famous Saung Angklung and Cibaduyut leather market. With factory outlets, throngs of cafes, hotels, and the renowned colonial public building of Gedung Sate, Riau is the pinnacle of modern Bandung with architectural heritage remnants waiting to be explored! Cafe-hopping, boutique-shopping, and nature-trailing are all possible when in Dago. As the culinary and business centre right in the middle of Ir.H.Djuanda city forest, this is where the youths and young-at-heart are at any given time. One word: Rumah Mode (one of the best factory outlet in Bandung). 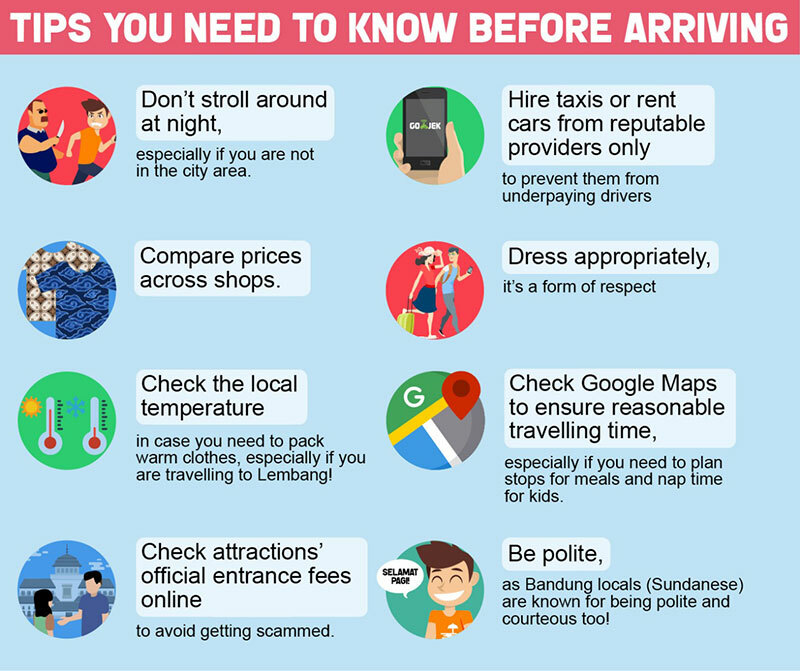 This official tourist checkpoint is the reason why Setiabudi is a must-visit district, along with the varieties of cool cafes, restaurants and a mix of local treats! Stroll along the small streets of Cihampelas and take in the creative local businesses lined up here. This iconic street used to be the jeans centre for decades and you can also find local crafts, affordable shopping spots, eating places and also the fancy Cihampelas Mall. Get your ‘tea-rapy’ here among the tea plantations or marvel at the misty sulfuric crater lake at Kawah Putih – and that’s not all. 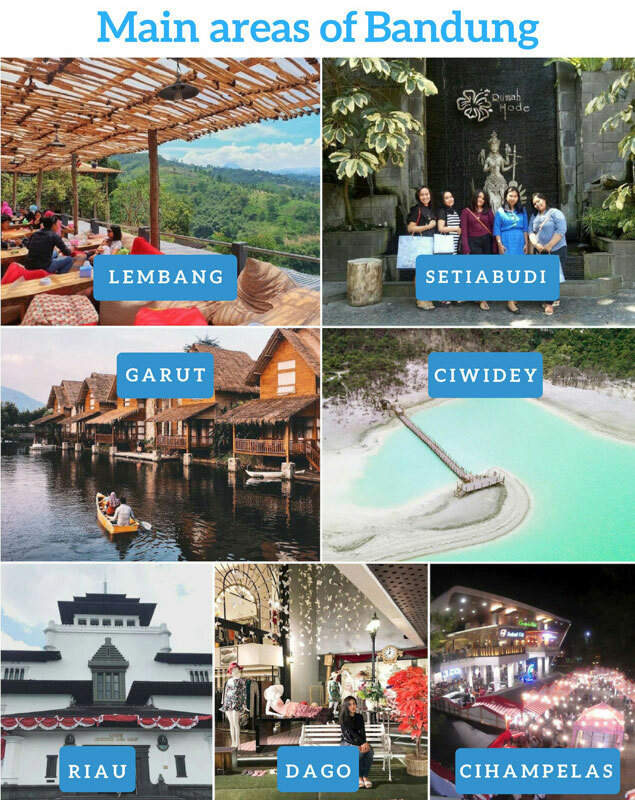 More fascinating natural attractions are waiting at Ciwidey, from camping grounds, strawberry farms, hot springs, lakeside and more. Located in the mountains north of Bandung, welcome to the picturesque sceneries of Lembang and enjoy its many family-friendly destinations. 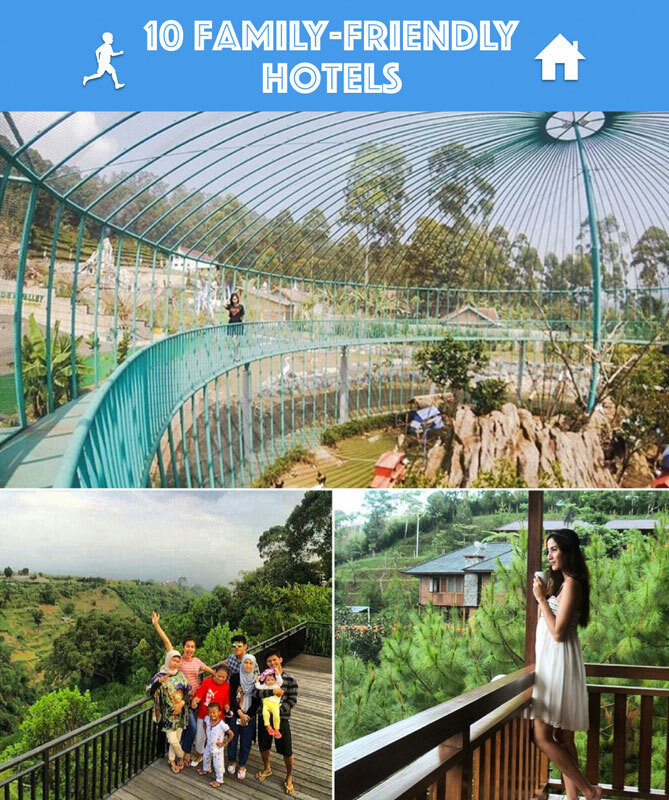 This is the ideal place for all your Instagrammable moments, nature adventures, and the well-known Tangkuban Perahu. Garut is situated 2.5 hours away from Bandung City and is another favourite for a perfect cultural, natural and historical escapade. Just hop in the traditional horse-pulled ‘Andong’, munch on the famous sweet sticky ‘dodol’, and take in the endless wonders of nature in Garut. a. Orchid Forest Lembang: Smell fresh orchids in the cool climate (More info). b. Tebing Keraton: This dramatic hill is all over Instagram! (More info). c. Ranca Upas: Be a deer whisperer at this conservation park and camping ground (More info). d. Kawah Putih: The mystical crater lake above the clouds (More info). e. Leuwi Jurig, Garut: The mini Grand Canyon with a crystal green waterfall (More info). With plenty of family-friendly attractions and cooler climates, Bandung is the perfect place for your ultimate family vacation! Both kids and yourself will be as happy as in Europe ;). a. D’Dieuland: The panoramic little European castle, Bandung’s ‘Disneyland’ (Website | More info in Bahasa Indonesia). b. Farm House, Lembang: The famous Hobbit house with educative values (Website | More info). 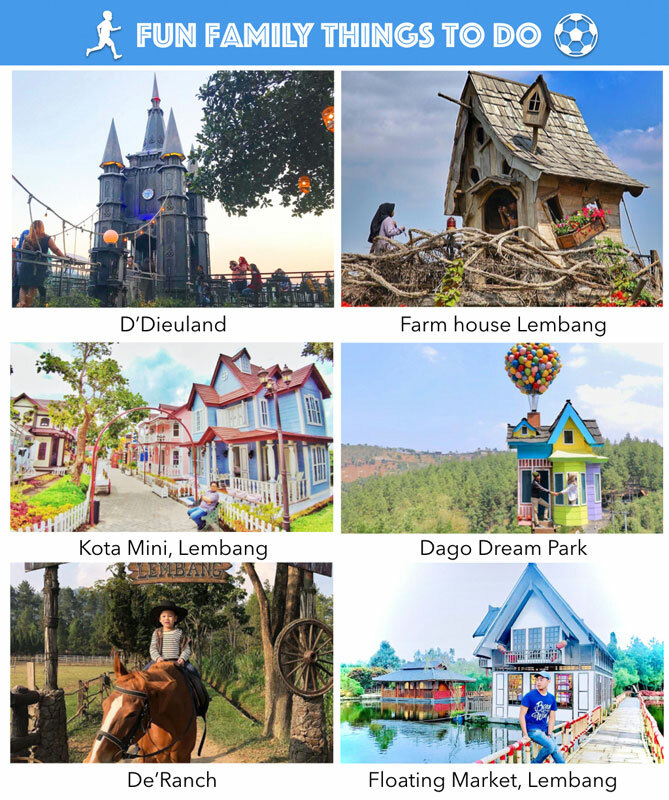 c. Kota Mini, Lembang: Dress up, play pretend and do much more at this colorful mini town (Website | More info). d. Dago Dream Park: A whole new world of theme park with exciting attractions (Website | More info). e. De’Ranch: Yeehaw! Giddy up with your little cowboys (Website | More info). 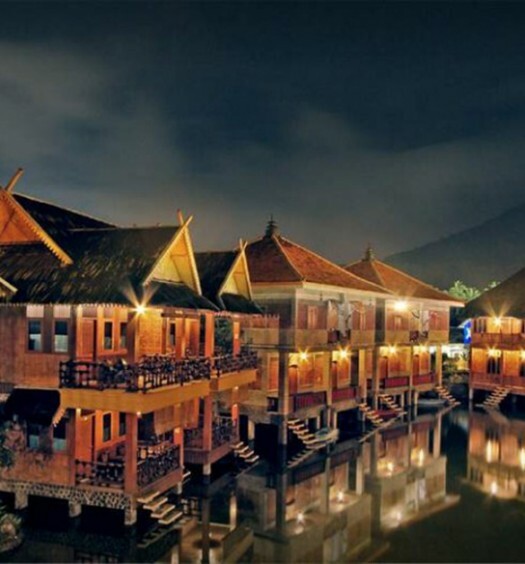 f. Floating Market, Lembang: Relax, dine and shop while afloat (Website | Coordinates here). 3. Where to shop till you drop! a. UNKL 347 Headquarters: From fashion apparels, surfboards, skateboards to homewares for your trendy youngsters (Website | More info). b. Rumah Mode: That epic factory outlet any first timer needs to experience! (Website | More info). c. The Heritage FO: Shopping for the whole family! (Website | More info). 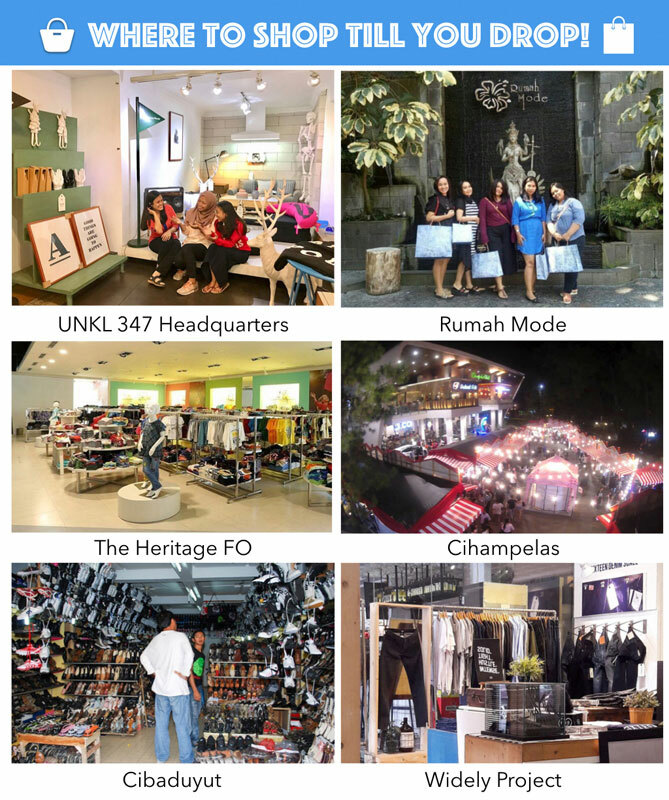 d. Cihampelas: Shop like locals at Bandung’s iconic jeans centre (More info). f. Widely Project: Fashion-forward with some of Indonesia’s best local brands (Website | More info). Besides just good coffee and great food, these cafes in Bandung have stepped up their aesthetic to provide you with unforgettable experiences. Check out these hipster cafes with beautifully designed spaces that will make your Instagram feed look spectacular! a. Kalpa Tree: The uber chic swimming-pool dining with gorgeous view (Website | More info). b. One Eighty Coffee: Toe-dipping, foot-soaking and fun-dining all at once! (Website | More info). c. Goldstar 360 Cafe: The whimsical Greek cave dining (Website | More info). 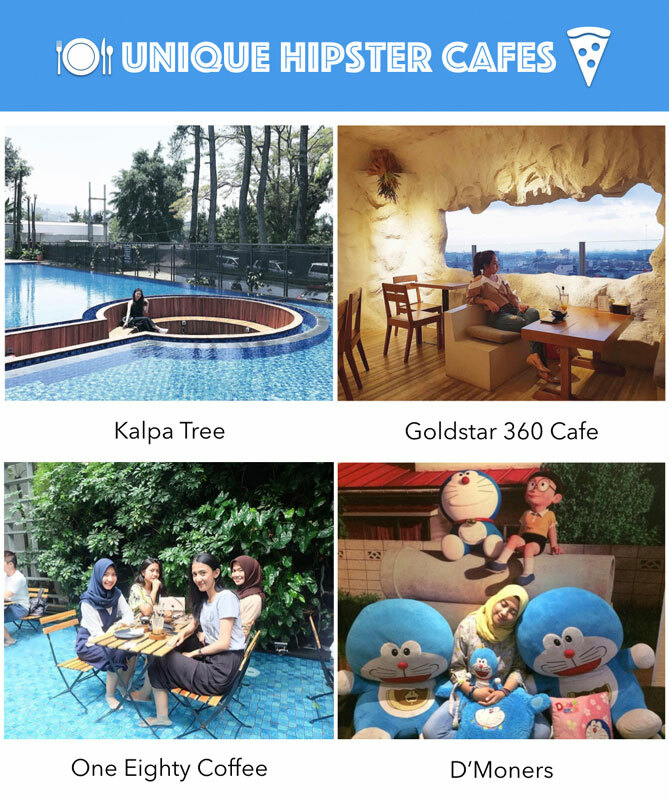 d. D’Moners: Because everyone’s a Doraemon fan at heart (Website | More info). At these restaurants, dazzling views are as spectacular as the cuisine, where mouthwatering plates are met with jaw-dropping scenery. a. Pinisi Resto: Ahoy! All aboard the pirate ship to set sail for unforgettable-land (Website | More info). 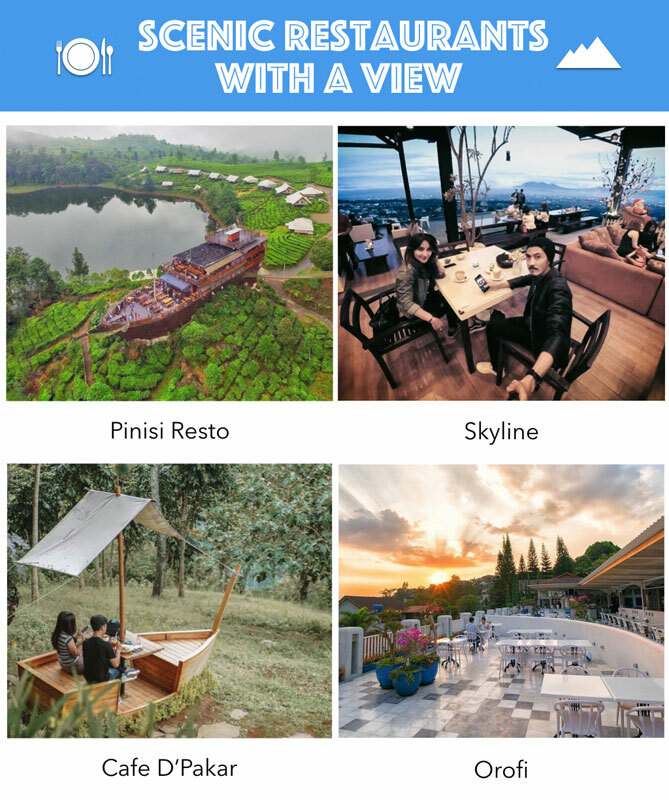 b. Skyline: Get to the top for Bandung’s atmospheric sky view (Website | More info in Bahasa Indonesia). 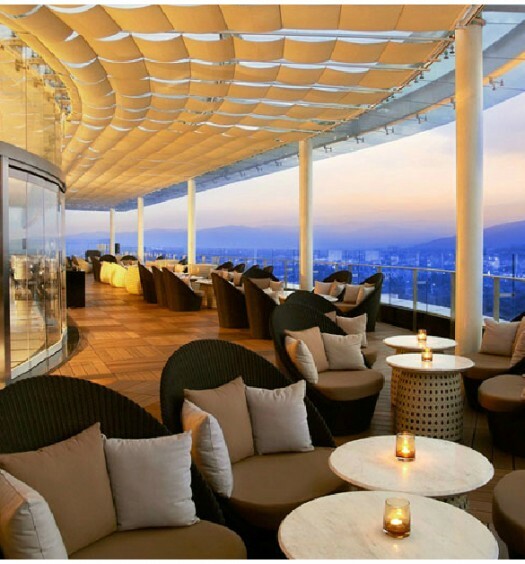 c. Cafe D’Pakar: Indulge with a side of mountain view (More info). d. Orofi: Glorious city views and Santorini vibes (More info in Bahasa Indonesia). Does dining out on vacation get complicated with kids? Not when you choose one of these family-friendly restaurants that feature meals and activities that are enjoyable for the whole family! So hide your tablets and gadgets, your kids will eagerly eat and explore right after. 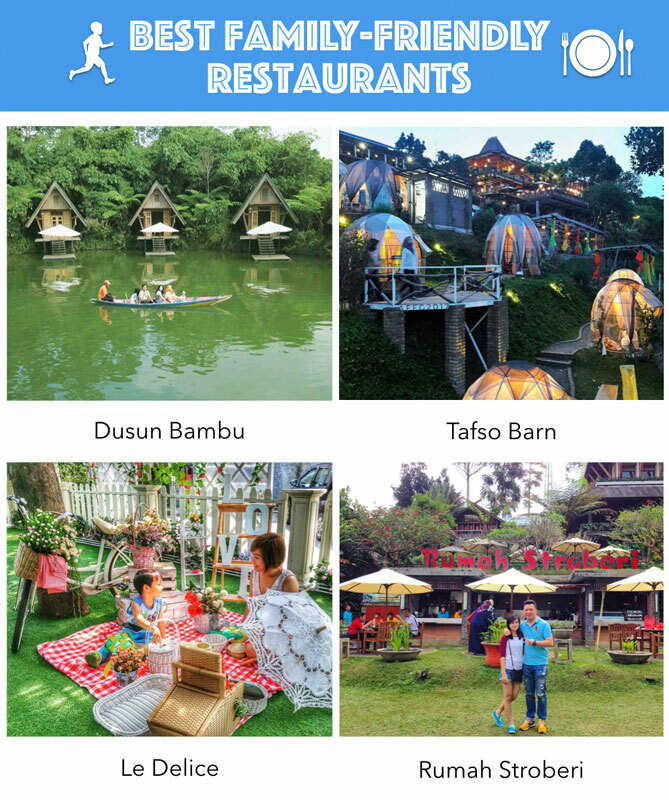 a. Dusun Bambu: What’s your style? Birdcage, lakeside or campers! (Website | More info). b. Tafso Barn: A vintage and rustic paradise with matching views (Website | More info). 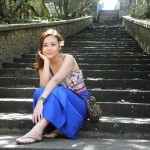 c. Le Delice: Instagrammable picnic lunch! (More info). d. Rumah Stroberi: More than just a strawberry house, farm and restaurant! (Website | More info). Exploring the corners of Bandung can be energy-draining, so don’t forget to stop by for a yummy break. 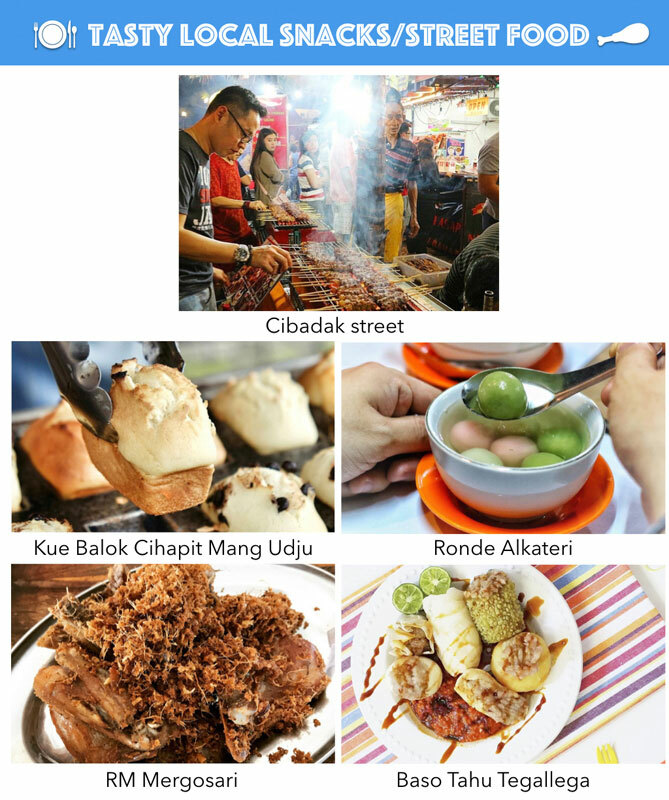 These local delicacies will get you going in between adventures and shopping sprees.Let’s dig in! b. Kue Balok Cihapit Mang Udju: Crunchy on the surface, milky soft inside (Website | More info in Bahasa Indonesia). c. Ronde Alkateri: Sweet Javanese ginger soup that warms your soul (More info in Bahasa Indonesia). e. Baso Tahu Tegallega Asli Sin Sien Hien: Legendary steamed tofu & meat dish since the 50’s (Website | More info in Bahasa Indonesia). More than just a way to rest your feet or sooth your back, pampering sessions here can be a special and affordable treat to look forward to while in Bandung! b. Everyday Spa: Time for that authentic Javanese treatment! (Website | Coordinates here). c. Martha Tilaar: Herbal treatments that will do good to your body (Website | Coordinates here). 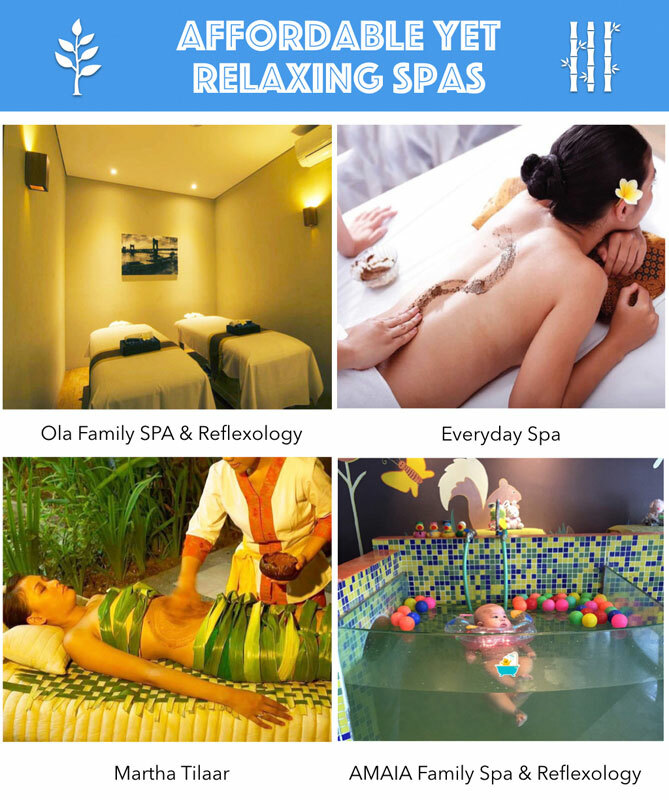 d. AMAIA Family Spa & Reflexology: A spa fit for the whole family (including babies)! (Website | Coordinates here). 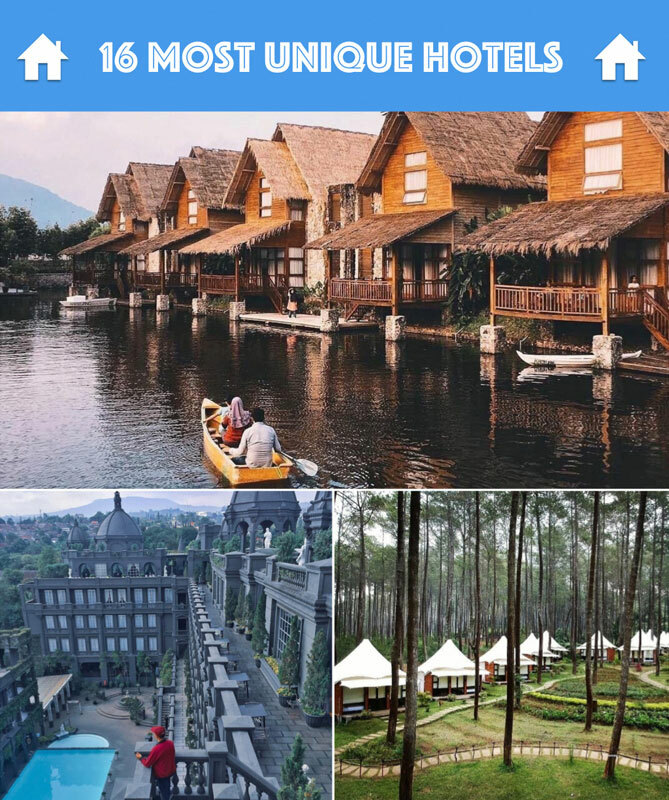 There is no universal ‘best hotel’ to stay at in Bandung, as much depend on your interests and budget. Whether you are keen for centrally located stays, unique ones, those fit for the whole family or something that won’t break your purse, here’s some of the best we recommend! Fancy a room with character or dream of sleeping under the stars? Get ready for a totally different vacation at these unique hotels. All the fancy stays, minus the splurge, at these budget boutique hotels. Set your camp here for the best shopping escapades! A much needed break in these budget hotels with a view and infinity pool. For a thoroughly enjoyable family time, these hotels won’t disappoint. For first-time travellers to Bandung, the dry season which usually lasts from June to September is a great choice for your holiday. These summer months offer a fairly warm weather with fewer chances of rain. Do avoid the rainy season from October to March. May to June is considered to be the high season as it’s the local school holiday period, not to mention Eid-Al-Fitr as well. If you don’t want to squeeze with the crowd, avoid holiday seasons such as Christmas and Chinese New Year too. Weekends are generally more crowded in Bandung, as travellers from Jakarta will stream in for a weekend getaway, so traffic will be heavier. 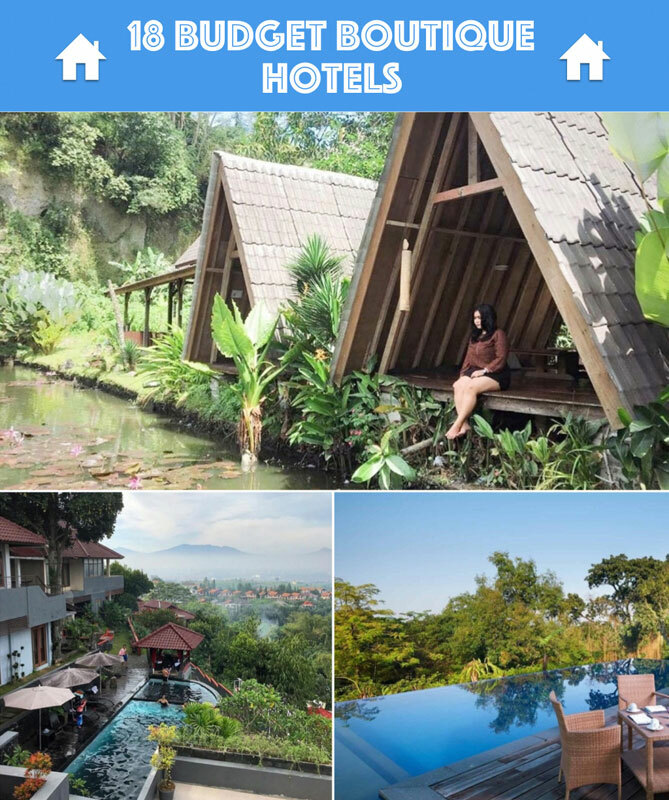 – Exploring Bandung city and local food: 3 Days 2 Nights (3D2N). 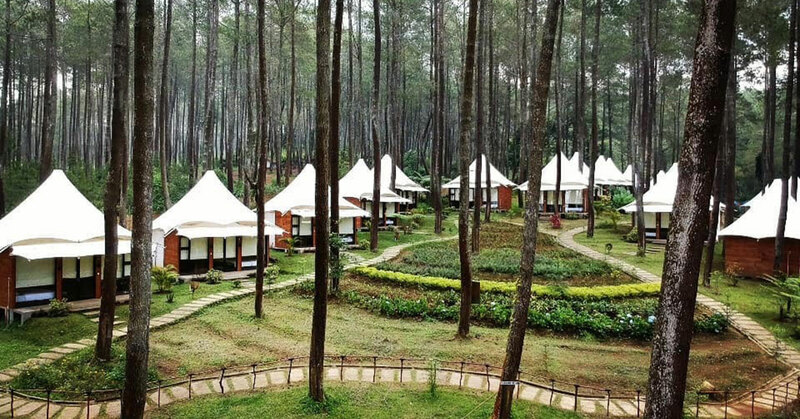 – Shopping and travelling to Lembang for family excursions: 4 Days 3 Nights (4D3N). 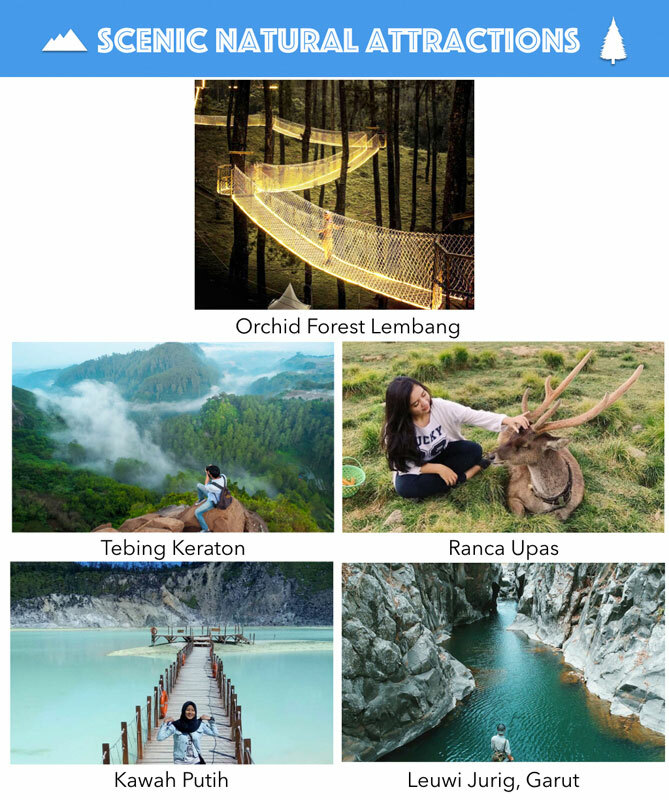 – Looking for adventures in nature (Lembang & Garut): 5 Days 4 Nights (5D4N).